This “Art Talk” appeared in the Summer 2008 issue of Texoma Living!. 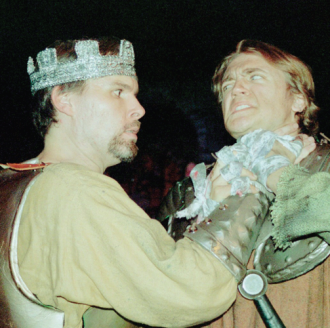 The 29th Annual Oklahoma Shakespearean Festival produced by the Southeastern Oklahoma State University’s theater department begins June 20 and runs through July 19. Guys and Dolls, Henry IV Parts 1 and 2, and The Complete History of America (abridged) will run at the Visual and Performing Arts Center at 1614 North First Street and The Montgomery Auditorium at 1405 North Fourth Street in Durant. Natalie Weaver, a professional actor and SEOSU theater department alumnus, will discuss her professional experiences and how SEOSU helped prepare her for a career on the boards. For tickets and information call the box office at (580) 745-2696, or send an e-mail to boxoffice@sosu.edu. South of the border, down Texas way, Denison offers Music on Main, a free concert series sponsored by the Braun Foundation, Downtown Denison, Inc., and the Denison Arts Council. Music on Main makes a return on Friday nights throughout the month of June. The Bullwinkles, Jason Elmore the and HooDoo Witch, Greg Guymon and Little Big Iron and others will be performing downtown in Heritage Park. Contact the Main Street Office at (903) 464-4452 for further information. Denison Arts Council, Texoma Living!, American Bank of Texas and Friends of the Arts will sponsor the Texas Singer Songwriter Series at the Rialto Theater August 2 with Carolyn Wonderland and November 1 with Slaid Cleaves. General admission and VIP tickets are available at the Denison Chamber of Commerce office, 313 W. Woodard Street, or call (903) 465-1551 to reserve seats, or log on to www.smalltownbigart.com. Hot Summer Nights continues Thursday evenings at 7:30 during June and July at the Sherman Municipal Lawn at the Oliver Dewey Mayor gazebo, located to the south of Kidd Key Auditorium. Sponsors for the performances include American Bank of Texas, Ramey Chevrolet and Grayson Home Health. Performances begin at 7:30 p.m. Artists this year include Memphis Soul Live, King Creole, and Rotel and the Hot Tomatoes. So bring your lawn chairs and a picnic and enjoy the show. Visit www.hotsummernights.org for performance dates and other information, or call (903) 957-0310. Sherman’s Theatricks conjures up Aladdin at the Honey McGee Theater July 11 through July 20. Theatricks is located at 313 West Mulberry, right behind the Finley Theater. Auditions for Oliver, which will run in the fall, will be July 14 and 15 in the evenings from 6 to 9. The Honey McGee Theater hosts a children’s workshop July 21- 25. Children aged four through the 8th grade are invited to take part. Tuition is $60, and some scholarships are available to reduce the cost of the workshop. For more information on upcoming performances, workshops, and auditions, call Web Crocker at (903) 893-8525, or log on to www.scptheater.org. And a last minute art note: Grayson County College will host Expressions IV, A Figurative Exhibit, at the 2nd Floor Gallery, above the school library, between May 21 and July 10. The exhibit will primarily concentrate on the human form with works from various local and regional artists. For more information log on to http://grayson.edu, or call Grayson County College at (903) 465-6030. The 12th Annual Denison Art & Wine Renaissance: Passport to Cognac at the Old Katy Depot signaled a resurgence of this “must attend” event. With the change of venue, back to an indoor event, more than 500 Texomans attended, dressed to the nines and ready to enjoy the evening.